Situated on Main Central Road, Manna Residency can be reached from KSRTC Bus Stand (0.6 km). Sathom Malankara Catholic Church is 0.1 km away from this budget property. The occupants are offered with a comfortable stay. Accommodation is provided in 18 spacious and well-kept rooms, spread over 3 floors. 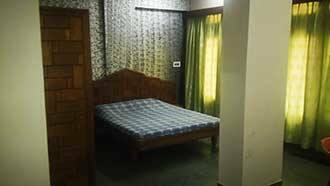 Each room is equipped with essential requisites like telephone, wardrobe, drinking water and premium bedding. Hot and cold running water is also available in the attached bathrooms.Manna Residency features parking area within the premises.Aluva Railway Station (16 km), Angamali Railway Station (16 km) and Cochin International Airport (14 km) are the travel hubs nearby. Attractions nearby include Sri Thripurayar Mahadeva Temple (15 km), Nagancheri Mana Park (4 km) and Iringole Bhagavathy Temple (4 km). We've booked an AC bedroom, 1,500/- in the month of November. On the exterior, it looks not a cool place with a dull receptionist. But, with the AC running perfectly and 24 hours hot water - I couldn't ask for much for what's paid. Add to it, having SaravanaBhavan hotel and two other good ones around, definitely an OK choice. Also, having seen some families check in too, I started to believe this is a good bet. Just expect a room to stay, that's all. Nothing too fancy.